After installing a tongue and groove ceiling, the next question is how to finish it. While the wood on a tongue and groove ceiling will naturally darken with age, providing a rich patina, it should be protected from the elements with some type of coating. Tongue and groove ceilings create an appealing, rustic feel. The biggest choice to make is between a natural finish and paint, as this choice will make the most difference to the look of the room. If you are seeking a natural look for your tongue and groove ceiling, the easiest solution is a simple treatment with linseed oil. This can be accomplished with a rag or large brush by wiping or brushing the linseed oil directly onto the wood. More thorough coverage can be accomplished, and many drips avoided, by applying the finish to the wood before affixing the wood to the ceiling. For many applications, polyurethane has replaced linseed oil because it is more durable and resistant. However, for a ceiling application, linseed oil is just as good, because ceilings don't receive any wear. Linseed oil is also more sustainable and less environmentally harmful than many forms of polyurethane. Stain should be used with caution on ceilings. A ceiling that is made too dark can leave a room with an oppressive feel. Used in moderation and in lighter tones such as golden oak, a stain can give a rich feel to a den or lounge. 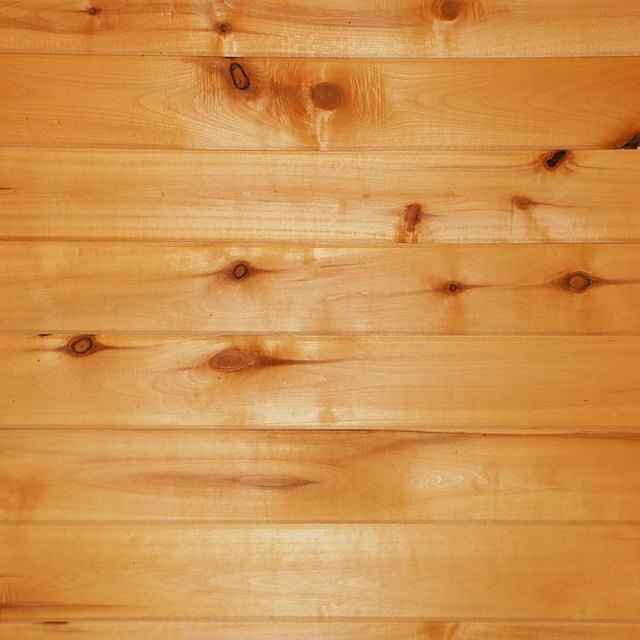 If you choose to stain your tongue and groove ceiling, combine it with white or light-colored walls in order to avoid creating a room that feels like a sauna with too much wood in it. Some homeowners choose to paint their tongue and groove ceiling. If you choose this route, you need to seal any knots in the wood with shellac prior to priming or painting. If you don't do this, the sap that is in the knots will bleed through any paint you put on and ruin your paint job. Because shellac isn't porous, it will seal the sap inside of the knots and keep it there. After sealing the knots, prime all visible surfaces in order to create an adhesive surface for the finish coat. Several finish coats should be applied in order to create a rich coverage. If you have any doubts about painting your wooden ceiling, put it off for a while. Once the paint has gone on, it isn't coming off without an awful lot of work. What Trees Are Telephone Poles Made Of?